strategically centered when used with a holder. bakery box offerings. You wanted pink boxes - here they are. Pink Cupcake Boxes are Here! This pink cupcake box is made for the cupcake holders below. here was made for the box so it's nice and snug. fit. 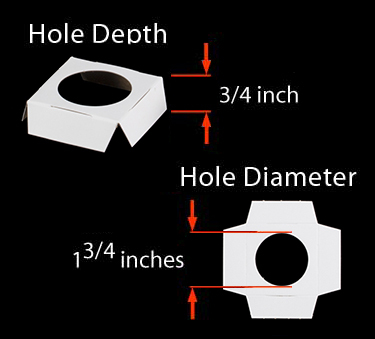 Our boxes + our inserts = perfect fit. of your sweetest treats through the window. under the picture. Six jumbo cupcakes is a lot! Our box can take it - but bend at the knees. pink boxes and so the fit is perfection. 19" x 14" x 4" Pink Cupcake Box with Window - Holds...It Holds A LOT! and it worked out great! Cupcake Holder Sold Separately From Box. with the mini cupcake holder listed just below. be big! Pile it on with this deeper pink box. their cupcake paper cups 3/4 full with batter. *Special Note: These Should Work for Your Cupcakes As-is. Check out our new cupcake stands! Click a picture below! A solitary cupcake carries a couture countenance when displayed in a box made for that very purpose. 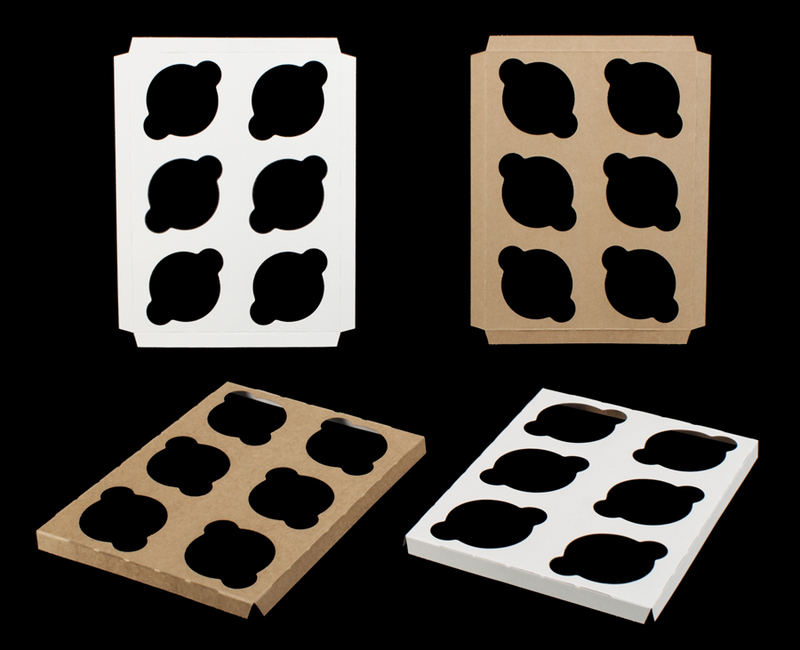 Using this individual cupcake insert will keep your cupcake safe and centered its high-end cupcake box. The cupcake insert keeps your cupcake frosting kitchen-perfect. 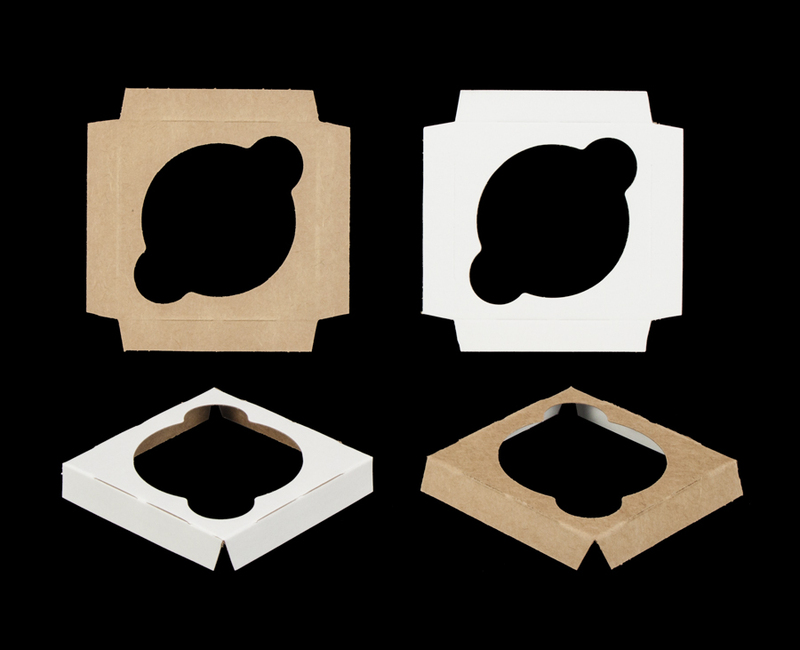 To match brown boxes, turn the reversible cupcake insert inside out. This sturdy cupcake insert will ensure that one dozen of your cleverly crafted cupcakes are prevented from plowing into one another, spoiling your perfect presentation. Choose from one of our many cupcake boxes designed to hold a dozen of your cupcakes and pair it with this one dozen cupcake insert to get your cupcakes to their delectable debut looking as lovely as when you finished frosting them. You can even turn the cupcake insert inside out when using Natural Brown cupcake boxes for a perfectly warm presentation of your sweet eats. One cupcake is nice, but two are twice as nice. 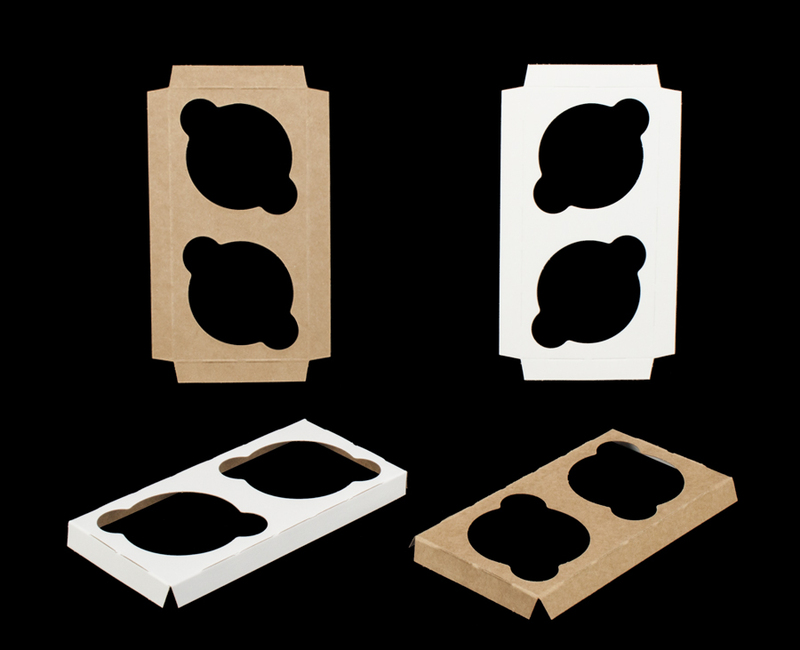 This cupcake insert looks great in any of our 2 count cupcake boxes. A lot of you asked your Box Shop to create a double cupcake box and tray, so we did! The cupcake tray and box work so well together because they were literally made for each other. Remember, the insert is reversible - white on one side / natural brown on the other. Set the stage for two of your sweetest eats using this fancy little insert. Set up one of the boxes that work with this cupcake insert. Slide the four count cupcake insert in. Place four of your proudest cupcake creations into the box and behold how your cupcake insert keeps your confections evenly spaced and looking polished and professional. Your four count cupcake insert will not only make for an elegant presentation. On the practical side, it keeps your finessed frosting from becoming malformed from cupcake collision. 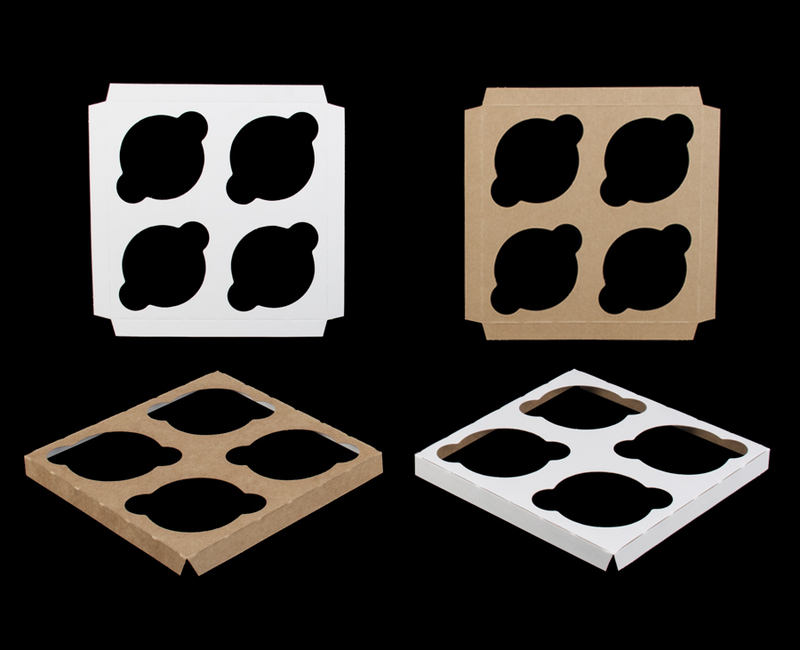 Turn your cupcake holder brown-side-up and you have a perfect match for our Natural Brown Cupcake Boxes. This half dozen sturdy cupcake insert will work to ensure that a lucky half dozen of your masterpiece cupcakes arrive at their destination unaltered by the normal bumps and jostles that come with transporting valuables from A to Belly. Turn the cupcake insert inside out when using Natural Brown cupcake boxes to have a natural match. 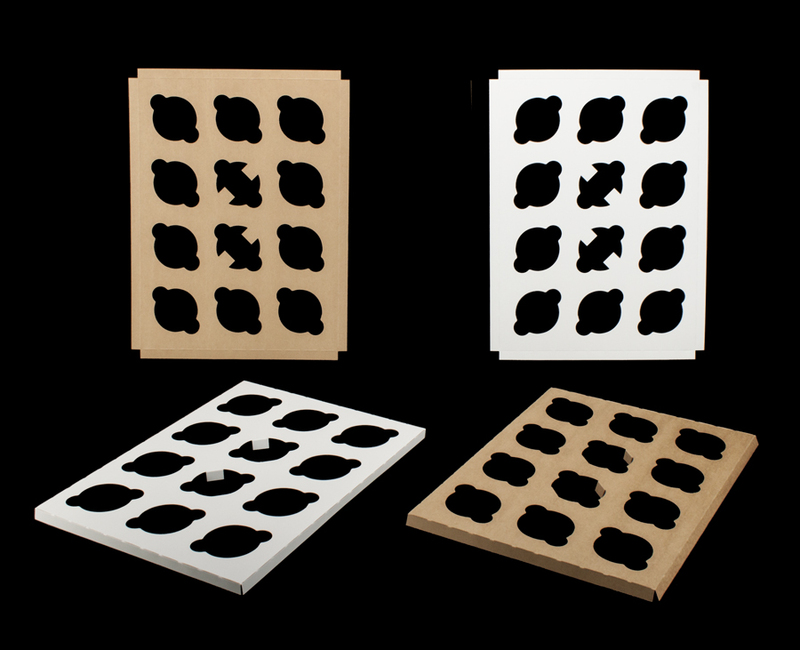 Buy this cupcake insert and set the stage for six of your standard cupcakes to shine! The box business is a business of details. We love when things work together so well, you just know serious thought and consideration went into the design. 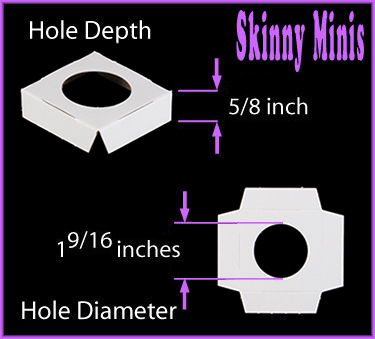 This two dozen cupcake insert was designed to fit inside of our two dozen count cupcake boxes. And the cupcake box and insert were both designed with 24 of your unique cupcakes in mind. It pays to have a plan when moving two dozen of your prized cupcakes. BRP Box Shop has you covered. Use this cupcake insert and one of our cupcake boxes to make moving twenty-four works of art, in a way that is easy and smart.